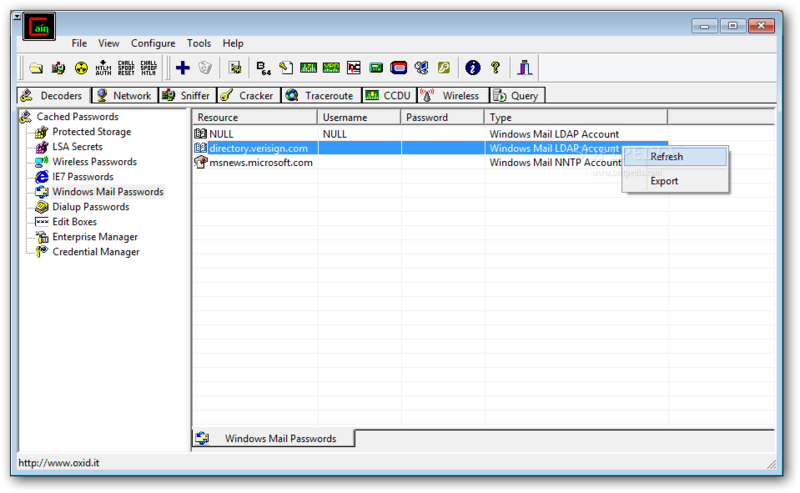 This utility helps you decrypt or recover your lost or forgotten passwords. Cain & Abel is a password recovery application for Microsoft Operating Systems. It allows easy recovery of various kind of passwords by sniffing the network, cracking encrypted passwords using Dictionary, Brute-Force and Cryptanalysis attacks, recording VoIP conversations, decoding scrambled passwords, revealing password boxes, uncovering cached passwords and analyzing routing protocols. It covers some security aspects/weakness present in protocol's standards, authentication methods and caching mechanisms; its main purpose is the simplified recovery of passwords and credentials from various sources, however it also ships some "non standard" utilities for Microsoft Windows users. The author will not help or support any illegal activity done with this program. Be warned that there is the possibility that you will cause damages and/or loss of data using this software and that in no events shall the author be liable for such damages or loss of data. Please carefully read the License Agreement included in the program before using it. The latest version is faster and contains a lot of new features like APR (Arp Poison Routing) which enables sniffing on switched LANs and Man-in-the-Middle attacks. The sniffer in this version can also analyze encrypted protocols such as SSH-1 and HTTPS, and contains filters to capture credentials from a wide range of authentication mechanisms. The new version also ships routing protocols authentication monitors and routes extractors, dictionary and brute-force crackers for all common hashing algorithms and for several specific authentications, password/hash calculators, cryptanalysis attacks, password decoders and some not so common utilities related to network and system security. · SIPS Man-in-the-Middle Sniffer (TCP port 5061; successfully tested with Microsoft Office Communicator with chained certificates). · Added support for RTP G726-64WB codec (Wengo speex replacement ) in VoIP sniffer. · X509 certificate's extensions are now preserved in chained fake certificates generated by Certificate Collector. · Extended ASCII characters support for SSID in Passive Wireless Scanner. · Some bugs in Cain's Traceroute fixed.